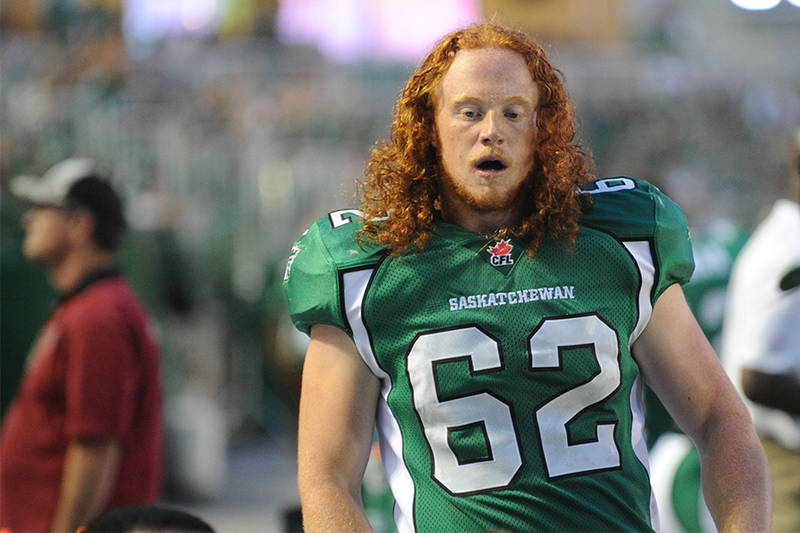 Former Huskie and current Roughrider Levi Steinhauer (photo courtesy of the Saskatchewan Roughriders). The Saskatchewan Roughriders are set to kick off training camp on Sunday morning at Griffiths Stadium in PotashCorp Park at the University of Saskatchewan (U of S). It's the fourth straight year that the Roughriders have brought their three-week camp to campus, with 120 players, coaches and staff using the Huskies clubhouse, field and U of S residences and food services. For longtime Huskies head coach Brian Towriss, it is a great opportunity for his staff to watch the Roughriders prepare for the upcoming Canadian Football League (CFL) season. "It's a benefit for our staff because the Roughriders pretty much open the doors to us to sit in on meetings and you observe practices as well," said Towriss, who is the longest serving university football coach in the country, preparing for his 33rd season at the helm of the Huskies. "We get behind the scenes and have the ability to go to meetings and interact with their coaches and we are welcome to be a fly on the wall for the most part and that is great for us." The Roughriders, who will train here through to June 17, hit the field for their first workout on Sunday at Griffiths at 9 am, with a number of Huskie connections at camp. Current Huskies defensive co-ordinator Ed Carleton will serve as a guest coach with the Roughriders, while former U of S football standouts Tim Agbaje and Levi Steinhauer are both back for their second and fourth seasons, respectively, with the Roughriders. "Those are two veteran guys who have another opportunity this year, so that is good," said Towriss. "We have had a number of players go on and play for the Roughriders over the years. We have had three or four of them retire in the last few years, so our presence isn't as great as it once was, but certainly both of those guys are good players. Tim was a rookie last year in the CFL and Levi has been around the past couple of years and he is an outstanding special teams guy." Three members of last year's Huskies team will also be attending other CFL training camps, with quarterback Drew Burko and defensive lineman Emmett Tims having signed with the Montreal Alouettes and linebacker Geoff Hughes landing a contract with the Hamilton Tiger-Cats. Meanwhile, Huskies defensive lineman Donovan Dale is now a CFL free agent after recently being released by the Ottawa Redblacks. All-Canadian guard Laura Dally is in Edmonton taking part in Canada's women's basketball Olympic team tryouts, under the watchful eye of national team head coach Lisa Thomaidis, who led the Huskies to the CIS championship in March. Dally, who completed her five-year CIS career by being named the Canada West conference's most outstanding player and the U of S female athlete of the year, was one of 24 players picked to try out for the national team that will represent Canada at the Summer Olympic Games in Rio de Janeiro in August. The U of S men's basketball team has recruited an impact import player for the 2016-17 season with the addition of 6-foot-1 American point guard Jalen White from Charlotte, N.C. White played two seasons of NCAA Division 1 basketball at South Carolina State University before sitting out last season due to injury and has now signed his letter of intent to play for the Huskies this fall.